Because of its size, the plane has a 1-2 seat configuration.This is what I love most about flying with Seair when I’m traveling on my own: I don’t have to deal with a seatmate! The Dornier 328 can carry up to 32 passengers, with 3 crew (2 pilots, 1 flight attendant). Despite its size, the small aircraft even has a toilet at the back. I’ve never used their toilet though, since the flights I’ve taken with Seair hardly go over an hour and a half. 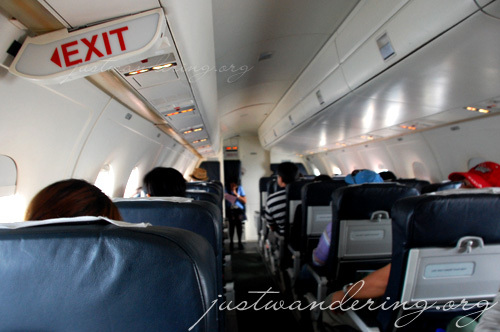 On board the Dornier 328, the flying time to Boracay is reduced to just 35 minutes — it takes me longer to travel from my house to the airport. There is ample room underneath the seat in front of you for your hand carried items. If you prefer to stretch your legs, you can also opt to stow your bags in the overhead bin. Due to the size of the aircraft, Seair only allot 10 kilos for checked-in baggage per passenger, and 7 kilos for hand carried bags. Checked baggage must not exceed 59 inches (length + width + height) in size, while hand carried bags must not exceed the dimensions of 54cm x 38cm x 23cm. South East Asian Airlines now offers complimentary transfers to all its passengers bound for Boracay. VIP service will be accorded to all SEAIR passengers by duly assigned transfer coordinators upon the plane’s landing at Godofredo Ramos Airport in Caticlan to the boat’s docking at the Cagban or Tambisaan Jetty Port in the island of Boracay. Seair is the only airline in Boracay offering round trip complimentary transfers all the way to Boracay Island and this has proven to be very helpful especially to first-time Boracay vacationers. For reservations and inquiries on flights and lean season promos, please call SEAIR Reservations at (632)849-0100 or visit www.FlySeair.com. This cabin interior with 1-2 seating configuration also reminds me of the 19-seater LET 410 on what was then Asian Spirit. Did they also have to weigh you with your carry-on bag upon check-in?